Below are a few digiscoped images of American Herring Gull Larus smithsonianus taken between August 9th and 15th, 2015, in Nova Scotia, eastern Canada (and for comparison a few gull images from Korea). 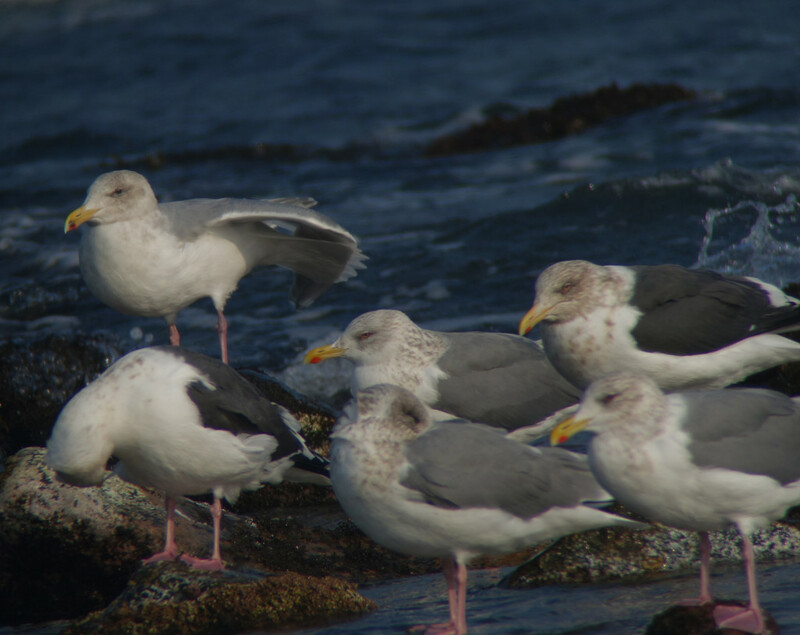 Most of the Canadian images, taken through a superb Swarovski scope, were taken on or near Brier Island at the mouth of the Bay of Fundy, where there is a large breeding colony of American Herring Gull (if memory serves, perhaps of c. 5,000 pairs according to a local ornithologist). 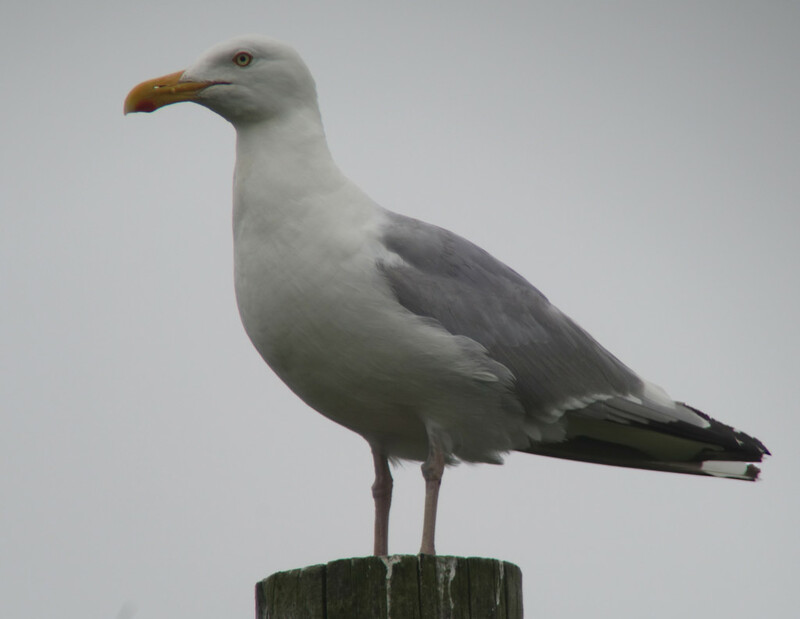 The only other large gull that breeds regularly in Nova Scotia appears to be Great Black-backed Gull Larus marinus. 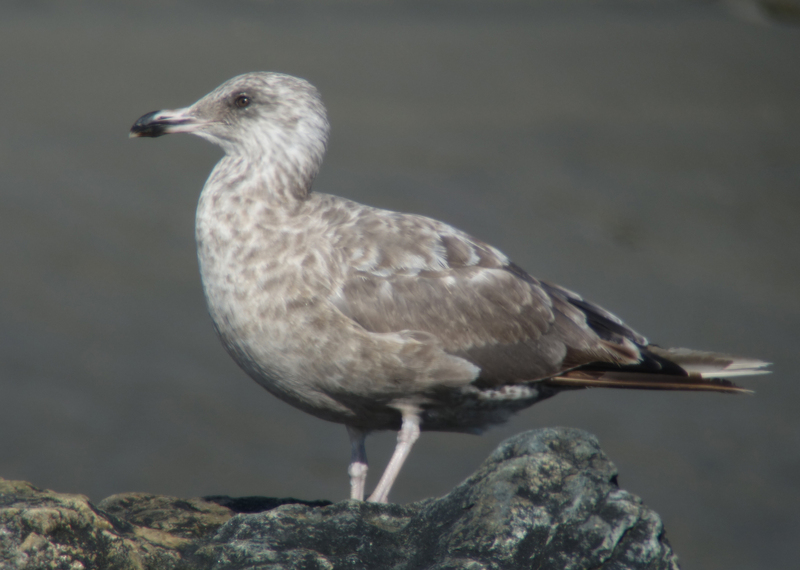 I am posting these images here on our blog to help with discussions on the identification and taxonomic treatment of smithsonianus, vegae and mongolicus, which our Checklist presently treats as three full species: American Herring Gull, Vega Gull Larus vegae and Mongolian Gull Larus mongolicus. The vast majority of the ~500 First Calendar-year American Herrings I saw on Brier Island (on August 14th and 15th), were in fresh juvenile plumage, and were very dark. All showed apparently solidly dark chocolate brown or grey-brown underparts; many showed solid dark on the closed greater wing coverts; and many showed only quite limited white in the tertials. 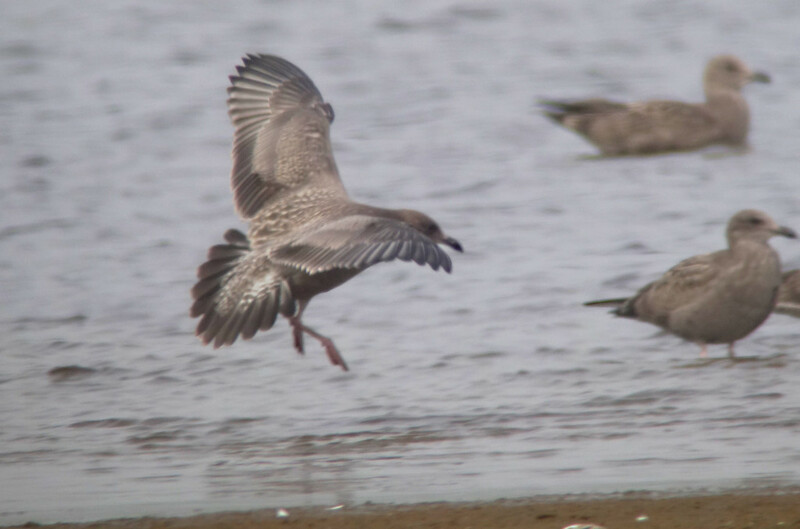 Although there was some variation in the details of main plumage tracts, all birds were therefore obviously more smoothly dark below and darker above than any similarly-aged Mongolian Gull that I have seen in August (or at any time) here in Korea. Even when still near the nest, juvenile Mongolian Gull look much paler and more contrasty above and below than this, and many are already progressing into First-winter plumage by mid-August. In flight, the vast majority of juvenile American Herring Gulls that I saw there showed very dense barring and even brown smudging on the rump, and much dark on the tail (bringing to mind a dark-brown version of Glaucous-winged Gull Larus glaucescens). Most juveniles in flight also seemed to have a really quite striking pale blaze across the inner primaries already – more strongly contrasting and extensive than might be expected either in mongolicus in August (or even as late as October) or in vegae in October or November, when juveniles start to arrive en masse in Korea. 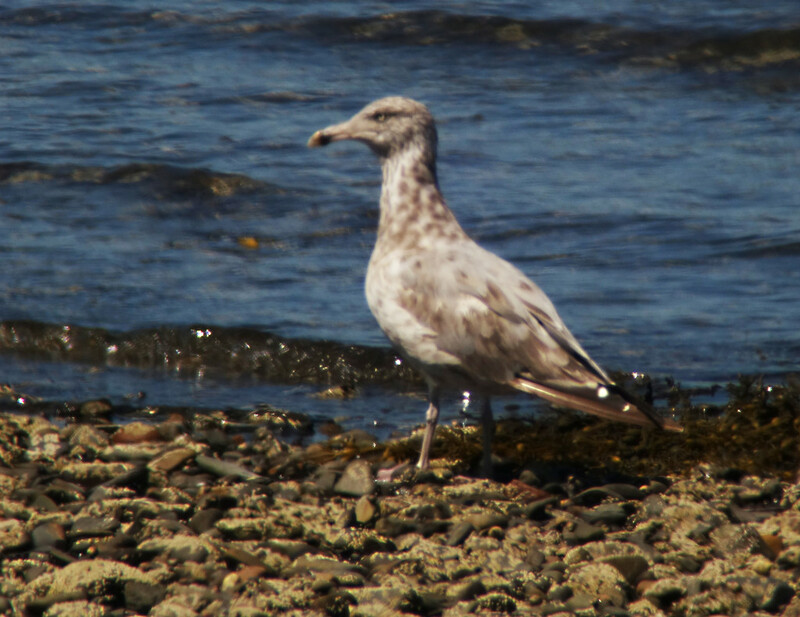 Although Vega Gull is quite rare in Korea between June and August, I have also yet to see any vegae or mongolicus here at any time of the year that resembled a presumed First-summer American Herring Gull seen at Kelly Cove, near Yarmouth (southernmost Nova Scotia), on August 10th. The wear in the primaries, the extensive pale in the bill and the mid-brown iris all seemed highly incongruent with a gull that otherwise seemed to have retained much of its dark brown juvenile plumage. 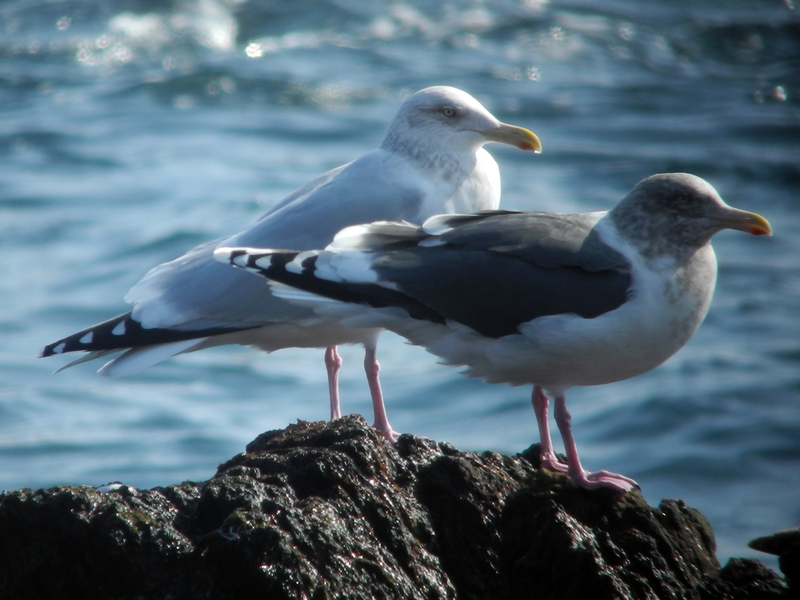 It therefore looked closer to me to Californian Gull Larus californicus (a species that does not occur regularly in Nova Scotia) than to any East Asian gull. An American Herring Gull tentatively aged as a Second-summer moving into Third-winter also appeared strikingly dissimilar in plumage to any vegae or mongolicus that I have thus far seen in Korea. Has anyone else seen birds like this here? 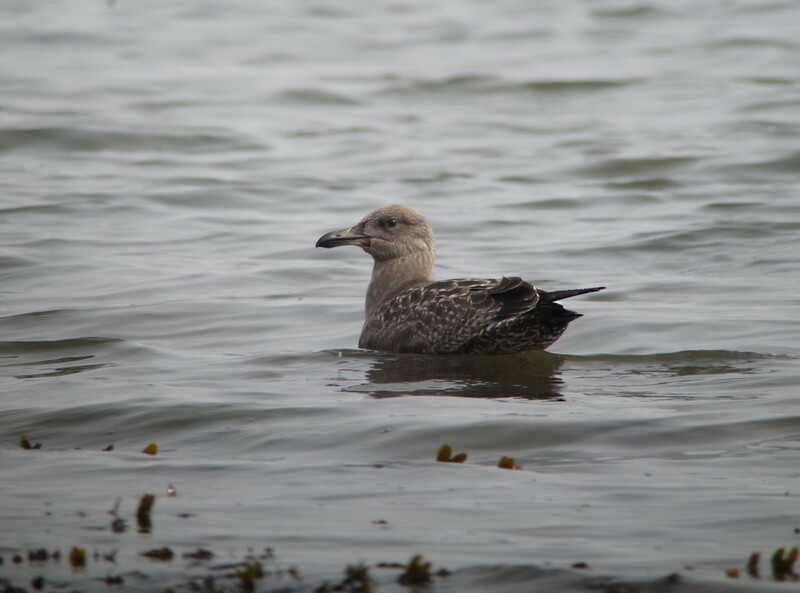 Structurally, the vast majority of adult-type or full adult American Herring Gull I saw also seemed somewhat different to the vast majority of vegae. 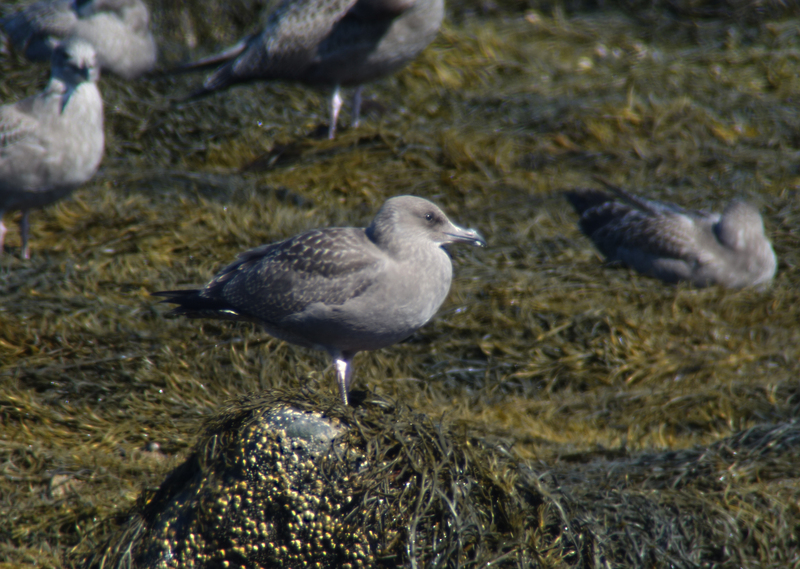 Although there is likely to be a fair number of birds that overlap structurally, most of the birds seen in Nova Scotia looked obviously large, proud and flat-backed, and also had long-looking bills that somewhat recalled Glaucous-winged Gull, in looking narrower at the base, and more swollen towards the tip. The impression of many therefore was that they were larger and more powerful than many of the American Herring Gull seen in previous visits to the west coast of North America, and they were therefore also quite unlike the sloppier-looking, sloping-backed, drooping winged vegae we usually see in Korea. Few, if any, had the full-looking nape of most mongolicus either. 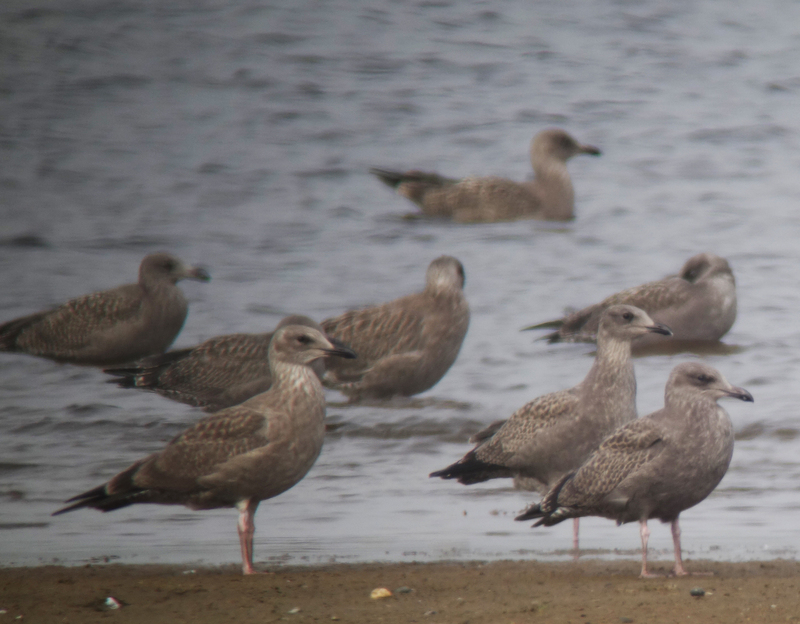 In addition, all the fully adult American Herring Gull that I saw closely (several dozens) lacked any head-streaking or nape-streaking (unlike most mongolicus and oversummering vegae seen in August in Korea); and all were clear- and pale-eyed, with a clean orange orbital ring, again unlike either vegae or mongolicus. 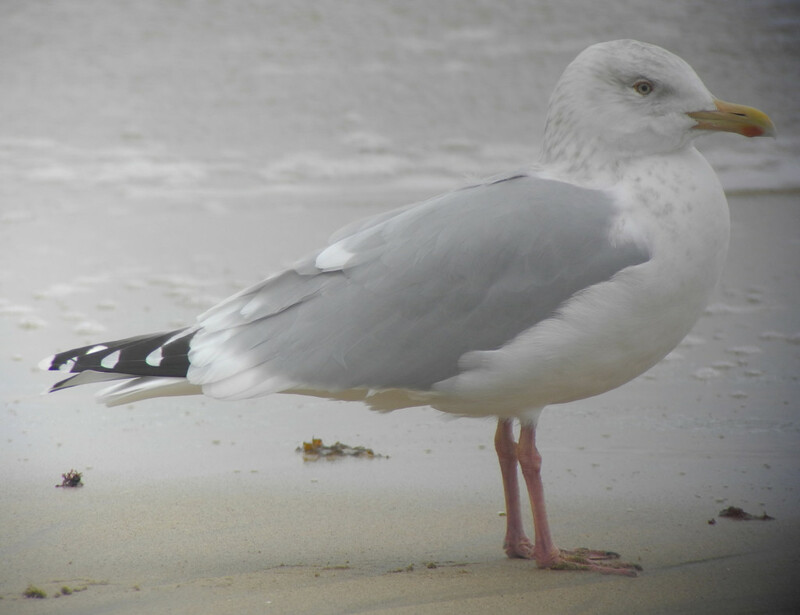 Seen in direct comparison with Great Black-backed Gull, adults and adult-type American Herrings in Nova Scotia appeared strikingly pale-saddled (so that even in bright light there was much greater contrast between them than e.g. between vegae or mongolicus and Slaty-backed Gull Larus schistisagus). However, none appeared to have the icy blue-grey saddle tones of some of the adult American Herring Gull that I have seen here (presumably, as most of those that reach Korea are from the west of the range?). 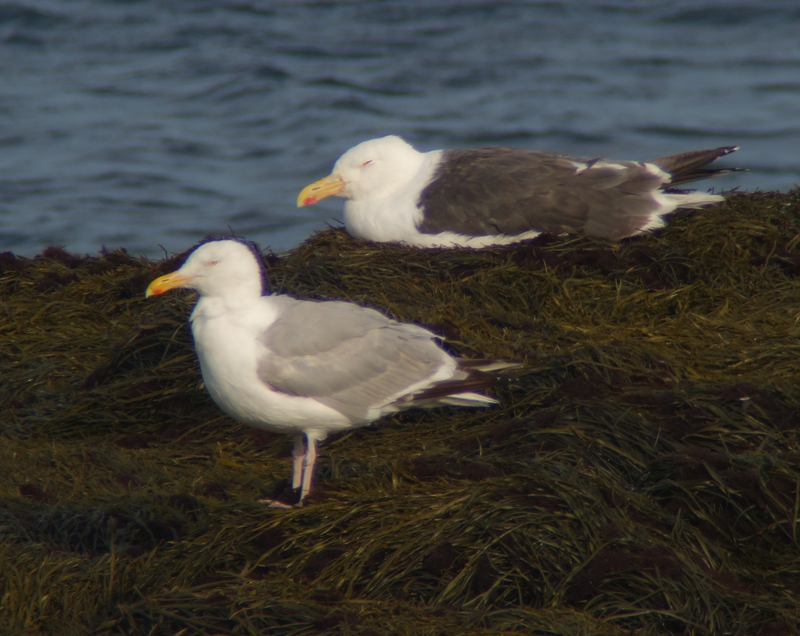 Although I did not make any sound recordings, one of the most striking features of American Herring Gulls in Nova Scotia was their calls. Typical flight and contact calls sounded clearer, higher-pitched and purer than corresponding calls given by either vegae or mongolicus (although nowhere near as striking, it nonetheless brought to mind a little the difference between the bugling of Siberian Crane and the deeper, throaty vocalisations of Red-crowned Crane). Has much research been done yet into vocalisations of American Herring, vegae and mongolicus? In addition to all the other major differences between the three species (which appear to include habitat, behaviour, moult timing, age at which adult plumage is reached, plumage, structure and bare part coloration), analysis of vocalisations might perhaps also prove helpful , both in identification of out-of-range birds and in informed consideration of taxonomic status. As always, comments and opinions are most welcome: thank you.